Modern demand for affordable housing that be constructed to meet the needs of a going population has called for construction methods to delivered on budget, in a fast and timely manner and to an accurate and compliant manner. By emerging traditional construction techniques with end to end automated construction technologies like FRAMECAD, many developers and project owners have found that they are able to deliver versatile and demanding projects in difficult environments under budget and ahead of schedule. Adopting a design-led methodology developers and project owners have been able to enjoy the low-cost benefits of automated engineering and detailing design, non-skilled labour and accelerated construction times with little effort. Flexibility is important because clients often have unique demands, and projects often require a creative approach and superior materials. Cold formed steel is unmatched in this regard, as a construction material for a wide variety of building types. 1. Strength. CFS frames are inherently strong and stable. For this reason, builders are relying on it more and more for structural, load-bearing walls and frames. Structural cold formed steel can support very large interior spans and high ceilings, and can bear a wide range of vertical and lateral loads. Galvanised CFS is weather-resistant and will not warp or break. 2. Versatility. The high strength-to-weight ratio and ductility of cold formed steel, as well as accurate, speedy profile production, make CFS extremely adaptable to unusual building designs. For example, CFS can help implement curves, artistic elements, or uniquely-angled exteriors — concepts that are often impractical to achieve with other materials, such as wood or concrete. 3. Precision. Cold formed steel pieces are very precisely cut. Roll forming machines quickly produce any CFS profile, guided by engineering software. And, CFS can be prefabricated in a factory-controlled setting, ensuring quality and uniformity. The flexibility of CFS can extend a construction firm’s capabilities to such projects as event venues, stadiums, galleries, convention halls and more. To read more about how CFS can accelerate the construction of mid-rise buildings, click here. FRAMECAD are experts in CFS production and manufacturing. Our end-to-end, design-led system helps CFS construction businesses assure productivity and superior output. Design — The FRAMECAD process allows for a huge range of design opportunities. If you are implementing an existing design, we’ll strategize with you to execute the project. You can also browse our catalogue of existing designs, or work with us from the beginning to create a design fitting the desired parameters. Software — FRAMECAD software enables state-of-the-art control over engineering and design from the start. Our solutions ensure precise detailing of CFS profiles and components, yielding a streamlined process for creating durable, replicable buildings. To view the latest software FRAMECAD have to offer, read this blog. Manufacturing — With FRAMECAD manufacturing systems, you can produce quality CFS components at scale. Whether you need trusses, wall frames, flooring or roofing, CFS profiles can be made onsite at your location or at FRAMECAD facilities, with our advanced roll forming equipment and tools. Onsite erection — Combine the versatility of CFS with FRAMECAD training and support, and you have a solution for erecting buildings onsite. This is a major advantage in areas where high-quality emergency shelters or relief work facilities need to be quickly built. Building products — FRAMECAD offer all the building products needed for exceptional CFS construction, including fasteners, connectors, steel rolls, flooring, and roofing. Our tools and products are certified to work with the FRAMECAD system for any type of project, from residential to industrial/commercial construction. Global network — FRAMECAD facilities and partners across the world help serve businesses with our design-led methodology. From engineering and design support to product orders and procedural walkthroughs, our expert team available to you anytime, anywhere. FRAMECAD stand ready to assist in CFS construction, no matter the project scope. Construction in the modern era demands innovation, and a readiness to tackle design problems with the right materials and process. Only those construction firms that adapt will win in the end. 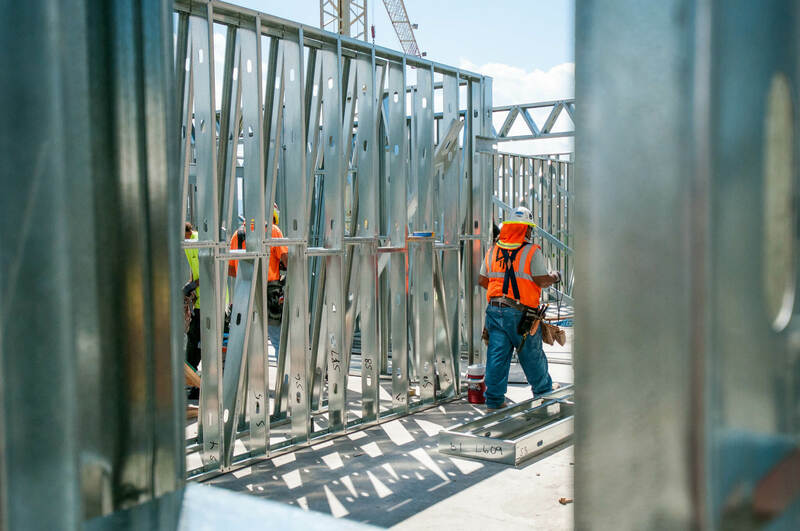 By using Cold Formed Steel along with the design-led FRAMECAD process, you can be as flexible as needed to meet just almost any construction challenge, from project to project. FRAMECAD can be your ideal partner in CFS construction. Our process includes advanced software tools and roll forming equipment that let you monitor performance, along with expert customer support and guidance every step of the way. Contact us here.